I recently returned from a trip to Hồ Chí Minh City and Hà Nội. As a lawyer who does Việt Nam work, I monitor developments in Việt Nam and my frequent visits help to give me an “on the ground” sense of the overall business climate in the country. We are seeing an increase in our China clients looking to diversify their Asia presence by going to Việt Nam and because I practiced in Hồ Chí Minh City and in Hà Nội for a total of ten years, I am the one tasked with assisting them. As more foreign companies look to diversify their manufacturing and product sourcing bases in Asia, Việt Nam is competing with the other ASEAN countries for more foreign investment and trade. Though not without its issues, Việt Nam has been generally placing higher than most of the other ASEAN countries as a potential place for foreign companies to invest. Just since my last Việt Nam visit several months ago, much has changed. 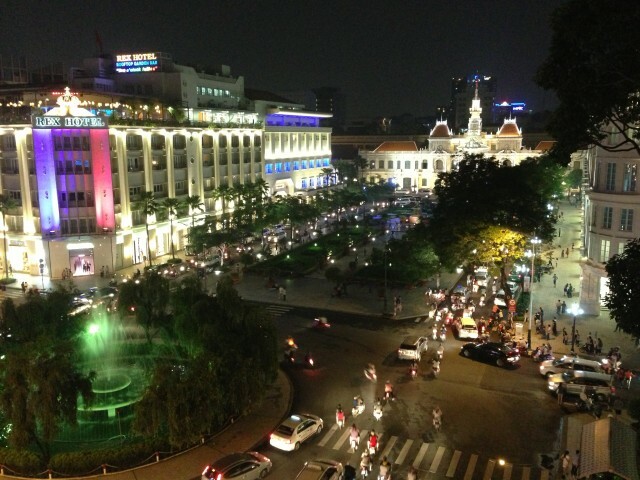 Nguyễn Huệ Boulevard in Hồ Chí Minh City has been renovated, creating a beautiful pedestrian-friendly thoroughfare in the heart of District 1. I also enjoyed traveling on the new multi-lane freeway which now connects recently renovated Nội Bài airport to Hà Nội. Positive developments to be sure, but not enough to gauge the current and business climate in Việt Nam. However, during this trip, the results of the latest Việt Nam Provincial Competitiveness Index (PCI) came out. The PCI, now in its tenth year, is an annual collaboration of the Việt Nam Chamber of Commerce and Industry (VCCI) and USAID. Simply stated, the PCI measures the business climate in Việt Nam for private (domestic and foreign-invested) businesses on a province-by-province basis and is intended to measure the ease of doing business in Việt Nam. In compiling its Index, it looks at factors like entry costs for business start-ups, access to land and security of business premises, the transparency of the business environment and equitable business information, the prevalence and amount of information charges, the extent of bureaucratic procedures and inspections, bias toward state, foreign or connected companies, proactive and creative provincial leadership in solving problems for businesses, availability of quality business support services, sound labor training policies, and fair and effective procedures for dispute resolution. The following are some highlights of this year’s PCI. The PCI showed increased growth and higher business confidence compared to the previous two years, with 46.1% of domestic firms planning to expand their businesses in the next two years and only 8.3% planning to downsize their operations or close their businesses. The Foreign Investment Survey portion of the PCI reflected an uptick in optimism among foreign-invested enterprises (“FIE”) in Việt Nam. Of the 1,491 FIEs from 43 countries surveyed, 16.3% had increased their investments in existing operations and 65.1% had added new employees. More than half of the FIEs said they intend to increase the size of their operations. The increase in employment and business expansion plans were the highest recorded for FIEs in the last five years. Interestingly, upwards of 80% of FIEs said their plans to invest in Việt Nam were not adversely affected by the riots which took place in several Vietnamese provinces in May 2014. Approximately half the FIEs surveyed considered other countries before choosing Việt Nam. Of the investors which considered other countries, 83% selected Việt Nam over other countries and 17% were in Việt Nam as part of a strategy to invest in multiple countries. Việt Nam’s competitiveness, as reflected in the PCI, is generally consistent with the results of the American Chamber of Commerce’s (AmCham) ASEAN Business Outlook Survey 2015, which ranked Việt Nam ahead of all of the other ASEAN countries except Indonesia. I expect Việt Nam to eclipse Indonesia if and when the Trans Pacific Partnership Agreement — to which Việt Nam but not Indonesia is a party — enters into force. The PCI survey showed that FIEs considered Việt Nam better than most of the other countries with which it traditionally competes on the issues of expropriation risk, policy stability and the ability of FIEs to influence government policies that affect the business environment for foreign investment in Việt Nam. Việt Nam is also considered to have a relatively favorable overall tax regime compared to other countries with which it is competing for foreign investment. As was the case the last year, FIEs find Việt Nam less attractive on the issues of corruption, regulatory burdens (e.g., business regulations, inspections and customs procedures), availability of quality public services, and the quality and dependability of infrastructure. Also, due to the shortage of skilled labor in Việt Nam, FIEs have had to provide additional training to 20%-35% of their newly hired workers. The cost of this has been offset somewhat by the fact that employee retention rates in Việt Nam are high, with relatively few employees leaving their employers for greener pastures after having been trained. With respect to customs procedures, Việt Nam is in the process of taking steps to simplify customs and tax procedures, and FIEs, through such organizations as AmCham, are lobbying the Vietnamese government to, among other things, provide for advance rulings from customs authorities on tariffs applicable to imported goods, a step that would go a long way to making supply chain issues for FIEs more manageable. Meanwhile, ground has broken on several new highways that will cut travel times in the southern, central and northern parts of Việt Nam. It is hoped that prospective improvements to Việt Nam’s Public Private Partnership regime and related legal framework, now under discussion, will help facilitate the some $200 billion in investment needed to modernize Việt Nam, bridges, ports, water sanitation, power, and other infrastructure.